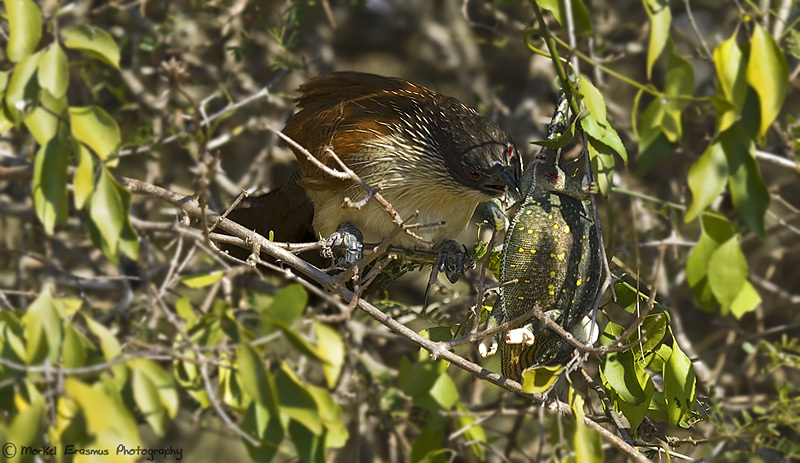 A Burchell's Coucal was busy trying to best a stubborn chameleon in order to have it for brunch! 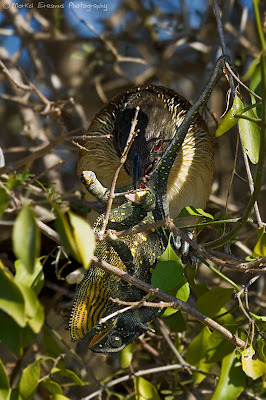 The chameleon clung tenaciously to anything he could find...with all the parts of his anatomy he could muster...first a foot, then another, and then the tip of its tail...and every now and again the coucal would get one of the chameleon's feet wrested free from its grip, which would result in just another foot grabbing another twig. I will try to share as many of the usable images I captured of this encounter. 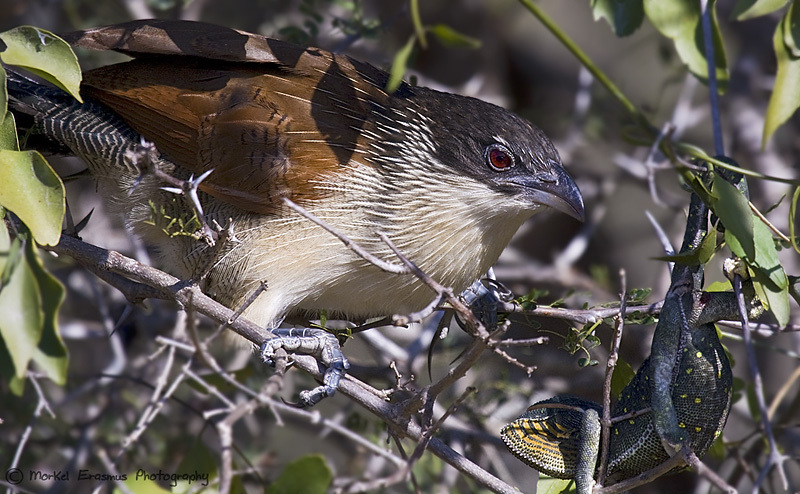 Unfortunately the setting with them amongst the lush foliage of a tree and the already harsh late-morning light didn't provide for striking award-winning photos, but it was exciting being able to witness and capture it nonetheless. This struggle continued for the better part of 40 minutes, with neither the predator nor prey willing to concede defeat. The chameleon was by this time bruised and must have had aching limbs from clinging for dear life to the branches of the tree. 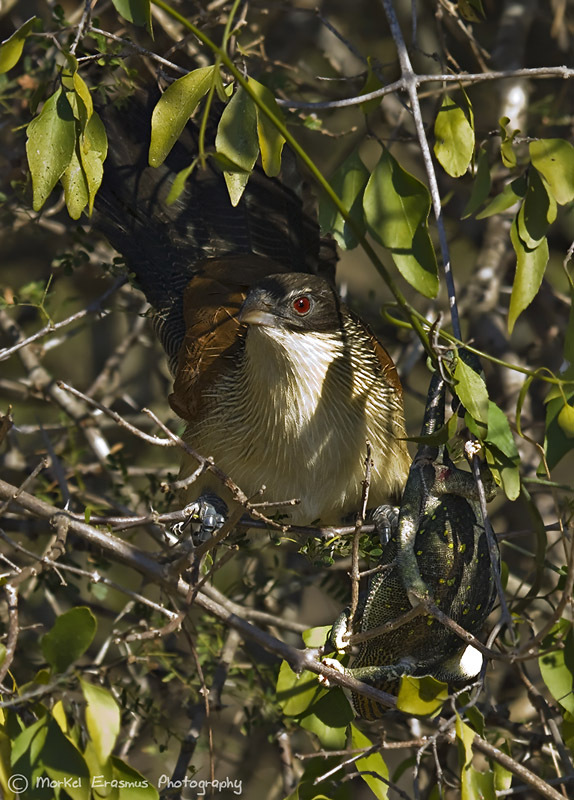 When the Coucal seemed to need to take a breather, it flew down to the ground to regather momentum and probably plan a new attack strategy. Then the strangest thing happened - as it launched off the ground up towards the tree for its final assault...it seemed to have lost the chameleon amongst the leaves of the tree! 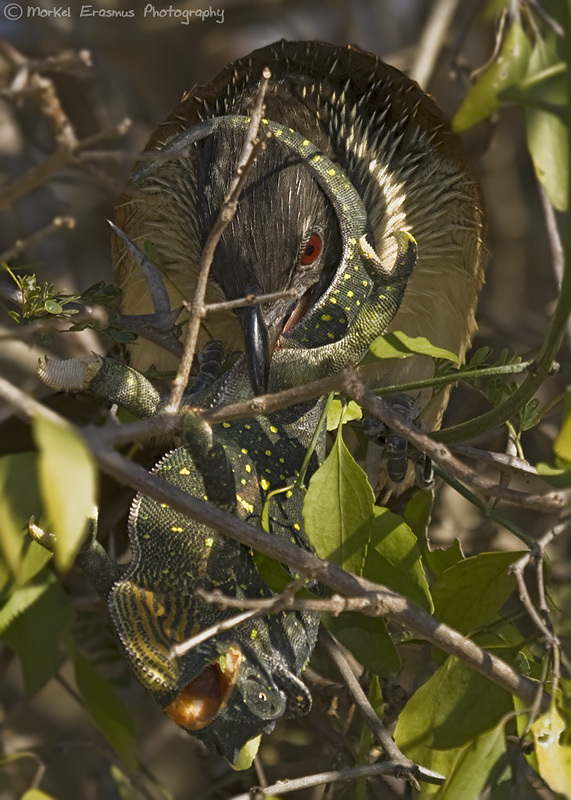 The chameleon had by this time decided to change colour and assume a stationary position (the only defence it really could offer when not clinging for all it was worth). 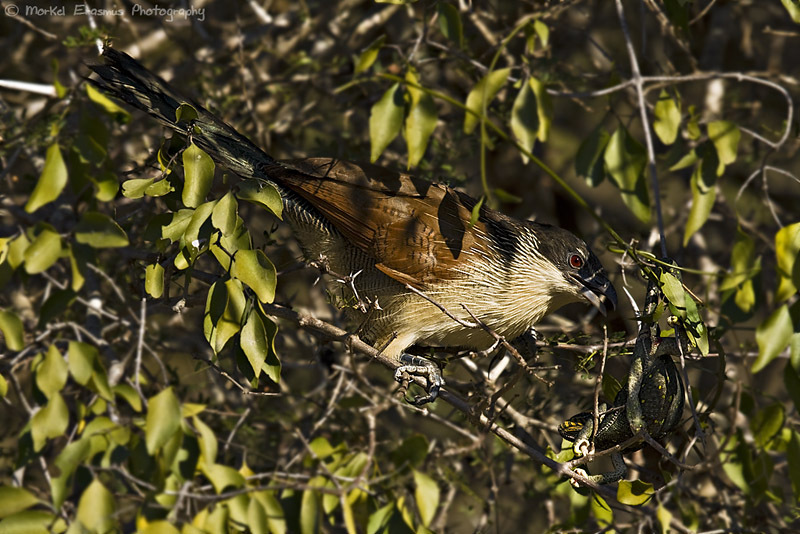 The Coucal then proceeded to search for the chameleon deeper into the foliage for a few minutes, and just seemed unable to locate its prey again! 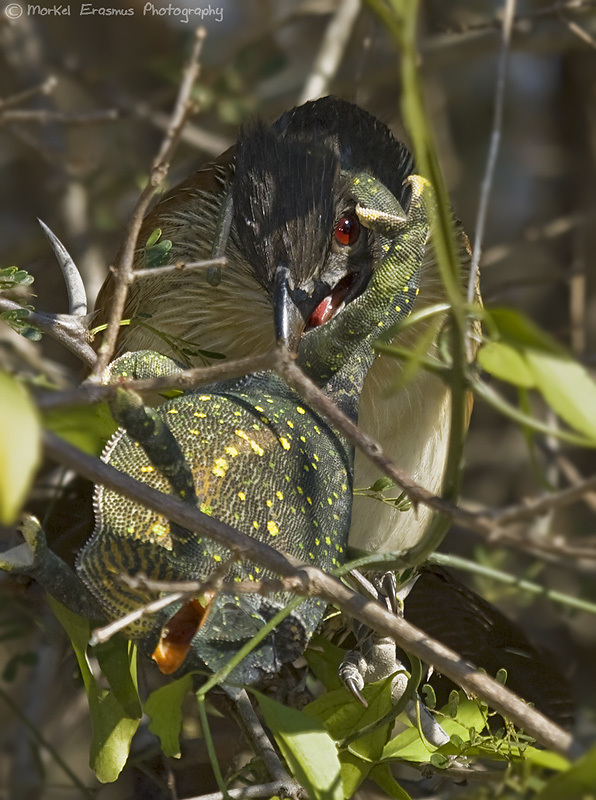 I don't know why or if the bird couldn't use its sense of smell to locate the chameleon, but alas, we had to move on towards our destination and we had a long way yet to drive for the day. 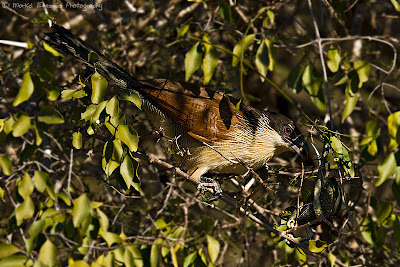 One this this experience taught me is to stop looking around for the big things when on safari...and to take notice of and appreciate the little things, the small sightings which seem insignificant at first glance but, if you take a minute to observe them, could end up being the most exciting part of your day on safari. 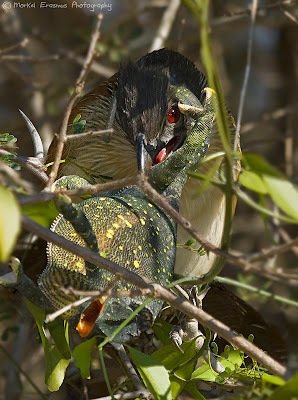 I would like to believe that the chameleon made it in the end...don't you? 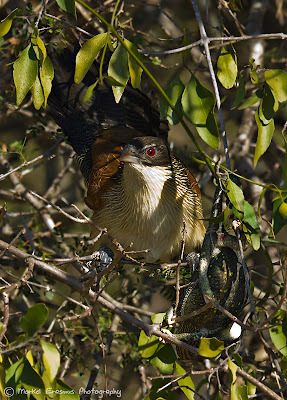 Though must say seeing the coucal such a treat! He is such a shy bird, always hear the beautiful call yet rarely spot in the branches.